Janelle In Real Life: a windy day. I love/hate that it's almost fall. Anyway, this is my not-quite-summer and not-quite-fall outfit! I loooove this chambray shirt and I'm excited to get to wear it more! It's a heavier fabric so I've been avoiding it during the heat but as it gets colder, you'll be seeing it more and more. Also, don't you love this necklace? It's such a fun statement piece and adds a fun splash of color! Have a happy day, dear friends. Y E S bring on the layers and apple cider!!! Fall is my favorite time of year! I know, I really am excited for fall! Thank you! It's so fun, right? I feel the same way about fall coming—although I love it a little more than hate it. I feel like there were so many things I wanted to do this summer, but didn't get to, yet I love everything about fall—the weather, cute layering pieces, apple picking.. :) Your outfit is adorable and def makes me psyched for fall! I know, I realized that I don't actually have hateful feelings toward fall, just toward the bitter, cold winter! I like the stripes and chambray combo! The necklace really pops with this! Thank you! And your blog is so cute, I'm definitely going to have to follow you! You look darling! I love that necklace on you. What a cute lovely outfit, plus is comfy! The pretty necklace is the cherry on top! I love this look! It's cute and perfect for fall! 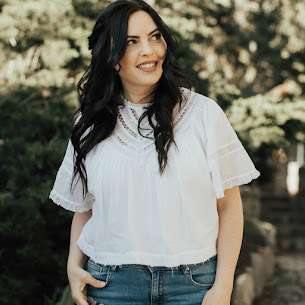 I'm in love with your chambray and your top! Thanks! Your blog is so cute by the way! This is a great look! Love chambray, isn't it just so versatile? Come visit sometime! LOVE this necklace! So fun. Oh girl, I feel EXACTLY the same way about fall coming. I'm ready/not ready. I feel like the seasons just change faster every single year! I LOVE your outfit. I have tried to wear my chambray as a jacket SO many times but I keep failing miserably. You mastered it! I'm so glad I stumbled across your blog - I am a new follower via GFC! 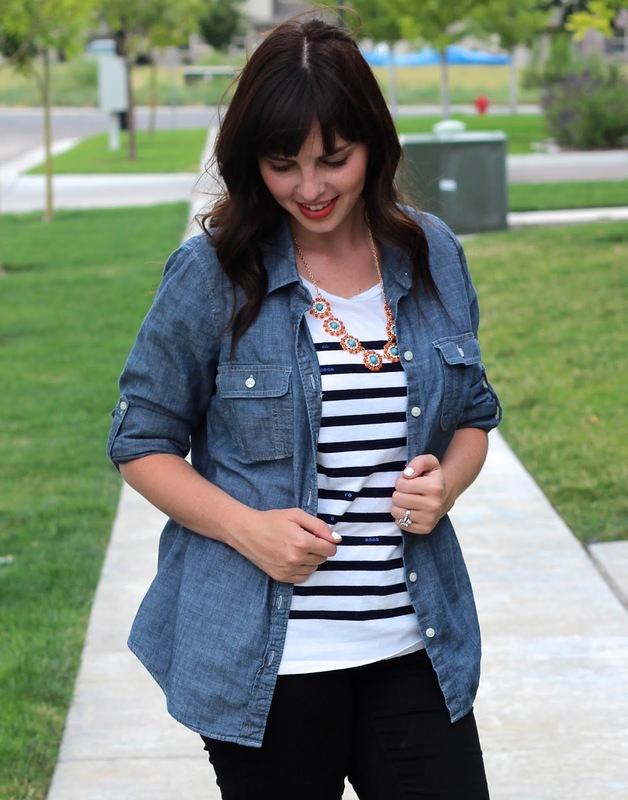 Love the striped top with the chambray top! So cute and casual. Love the gorgeous necklace too! You are so adorable! I love this look, and I share your feelings about Summer and Fall! Thanks! I love when outfits come together right. This is a perfect outfit for the in between seasons time! Your necklace looks great with it! AWww, this is such a cute and casual outfit! The necklace is gorgeous :) I know, I'm kind of sad about summer coming to an end soon. I feel like it was way too short... like always, but hey, the good news is... it'll come back next year, and summer styles will be fresh and new! I have the same sentiments as you right now regarding fall! But, I do love this outfit!! Chambray is such an amazing staple!! I could wear it everyday, and I love how you styled it. Thanks for sharing your look with Three-fer Thursday! Love your blog! And that outft is so pretty! I love the necklace and shoes!! Love this outfit! This is one that I can see my self recreating! Love it! Love how you added the statement necklace to this look! Great outfit! This is the perfect 'transition into fall' look. 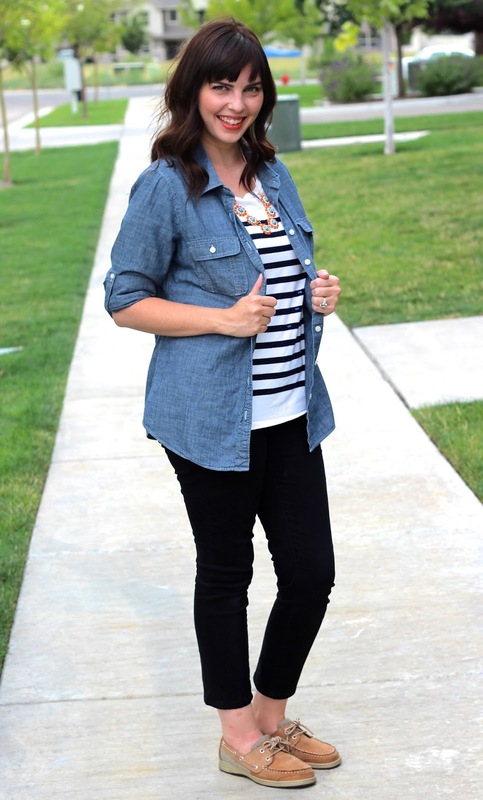 Love the chambray over stripes! Thanks for linking up for Real Girl Style. You've been chosen as oe of this weeks Glam Girls for Tuesday the 27th!